The Queen is dead. After a lifetime of waiting, Prince Charles ascends the throne with Camilla by his side. As William, Kate and Harry look on, Charles prepares for the future of power that lies before him…but how to rule? 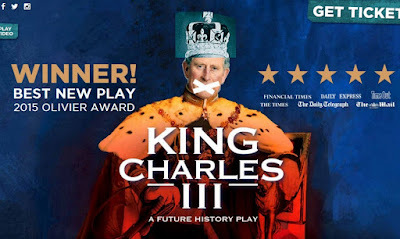 Winner of the 2015 Olivier Award for Best New Play, KING CHARLES III is the “bracingly provocative and outrageously entertaining” (The Independent ) drama of political intrigue by Mike Bartlett that comes to Broadway following a sensational West End run. Directed by Rupert Goold and starring the “magnificent” (The Observer ) Tim Pigott-Smith in the title role, KING CHARLES III has been deemed “the most insightful and engrossing new history play in decades” by Ben Brantley of The New York Times. This “bold and brilliant” (The Times of London ) production explores the people underneath the crowns, the unwritten rules of Britain's democracy and the conscience of its most famous family.